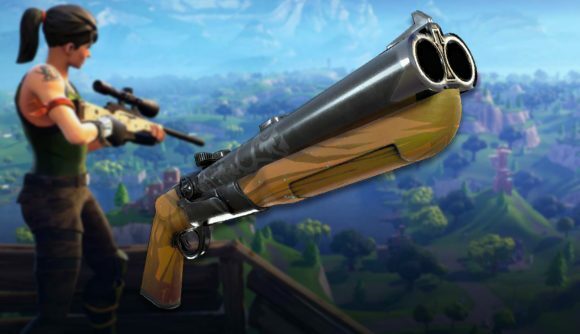 There’s an array of powerful new weapons on the way for Fortnite, with a new shotgun and two new types of sniper rifles uncovered as part of the latest datamines. Now, the in-game news feed has confirmed the Double Barrel Shotgun is on the way soon. Judging by the leaks, we’re in store for a powerful new addition. The in-game news feed says the new weapon will be a “new Epic and Legendary shotgun that can be fired twice in rapid succession.” This appears to be based on the break action archetype from from Save the World, which has shown up several times over in previous datamines. A break barrel shotgun was noted in datamines by XDA, and has been listed as a break action shotgun on Storm Shield One – either way, it seems to be the weapon coming in the next patch. You’ve got a 13.2 damage rating with short range and fast fire rate, balanced out by a two-round magazine, so yes, it’s a quintessential double-barrel shotgun in more common parlance. The new shotgun, Heavy Sniper, and Rail sniper all appear in the game files for the 5.2 patch, which was disseminated early with advance distributions of the game’s Android port. That’s no guarantee that the other two weapons will hit the game in the next patch – some of them have already been hanging around the files for some time – but we will at least have the new shotty. If any other weapon joins the line-up, however, the Heavy Sniper is most likely. Datamines last month suggested the weapon would be coming soon, and we’ve already got plenty of details on it courtesy of Storm Shield One. It pierces walls and does 157 damage per shot, though that’s balanced out by 1-round magazine and slow reload time. The item we don’t have much detail on just yet is the Rail Sniper. It sounds like it’ll follow the railgun archetype, though we don’t know how that’ll translate to the hard numbers of in-game performance just yet. Either way, it seems Epic is turning a nostalgic eye toward the glory days of PC shooters for the upcoming weapon. These datamines also pointed us toward a Durr Burger skin, plus a bunch of other new Fortnite skins besides. Fortnite patch 5.2 is due soon, so it won’t be long before we know exactly what to expect.